ProTec Polymer Processing, making its inaugural appearance as an exhibitor at CHINAPLAS, will be presenting technology and expertise designed for the targeted improvement of the properties of technical polymers, especially polyesters and polyamides. 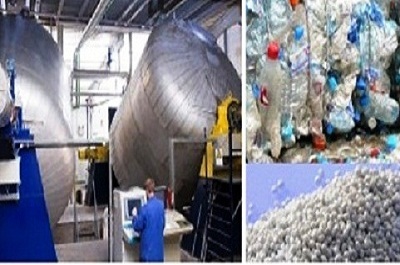 The customized systems technology required for this includes vacuum reactors from varying frame sizes through to complete turn-key manufacturing lines for the recycling of reusable polymer materials, such as the bottle-to-bottle recycling of PET. An important system component in this multistage process is the OHL tumble reactor, a rotation reactor that can be heated and evacuated, explains the German machinery supplier. The PET treatment process involves purging (decontaminating) the repellets inside of any volatile pollutants on the one hand, while at the same time allowing post-condensation (increasing the intrinsic viscosity IV) to take place on the other. The recycled PET (rPET) produced by the OHL process has an acetaldehyde content of ≤1ppm and exhibits material properties just like virgin PET product. The non-objection letter from the US Food and Drug Administration (FDA) verifies the safety of the PET recyclates produced in this manner with regard to direct contact with foodstuffs. Additionally, ProTec Polymer Processing will also provide information regarding the comprehensive SOMOS range of systems for the material handling during injection molding and extrusion: from powerful and energy-efficient dryers to conveyors and including highly precise dosing systems for all free-flowing types of plastics.